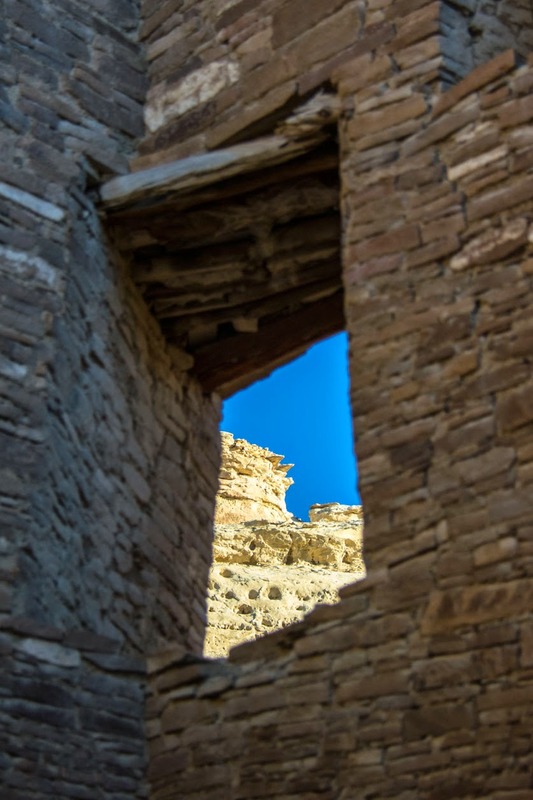 This morning it was clear and cold and Traveler Thirteen and I headed out early to investigate more of Chaco Canyon. 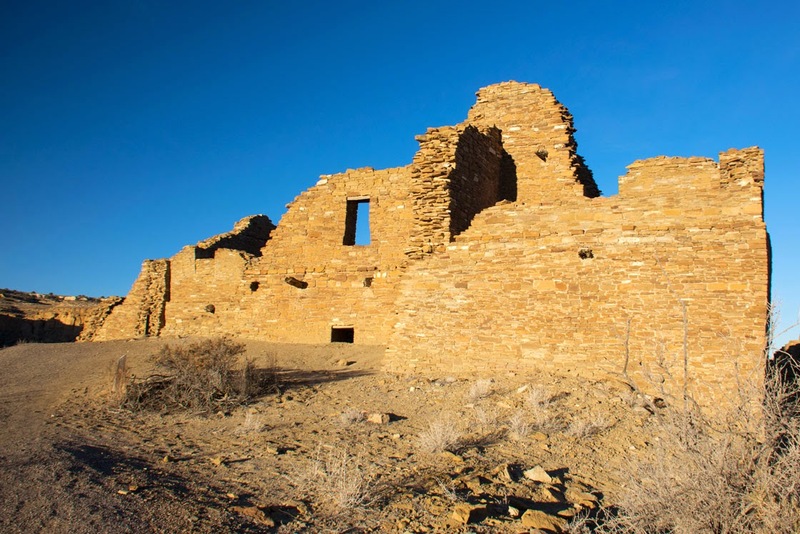 We wandered the ruins of Pueblo del Arroyo, Pueblo Bonito and Chetro Ketl. We began our hike listening to two groups of coyotes calling mournfully to each other from different parts of the canyon. Pueblo del Arroyo. Constructed in two short stages between 1025 and 1125. Morning light hits grass growing on Pueblo del Arroyo. I find morning light a lot harder to deal with. Many photographers love the a.m. golden hour but I'm not a big fan. I find light goes harsh too fast, whereas evening golden hour and blue hour I get better results. 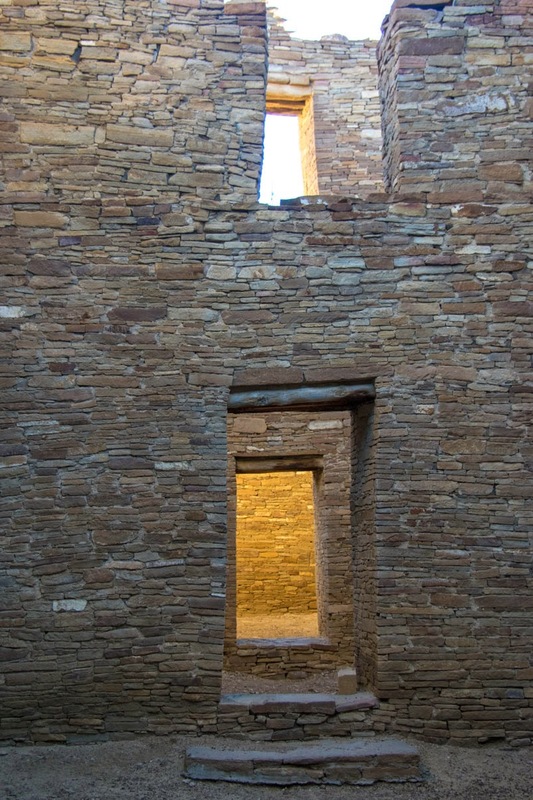 Pueblo Bonito interior. 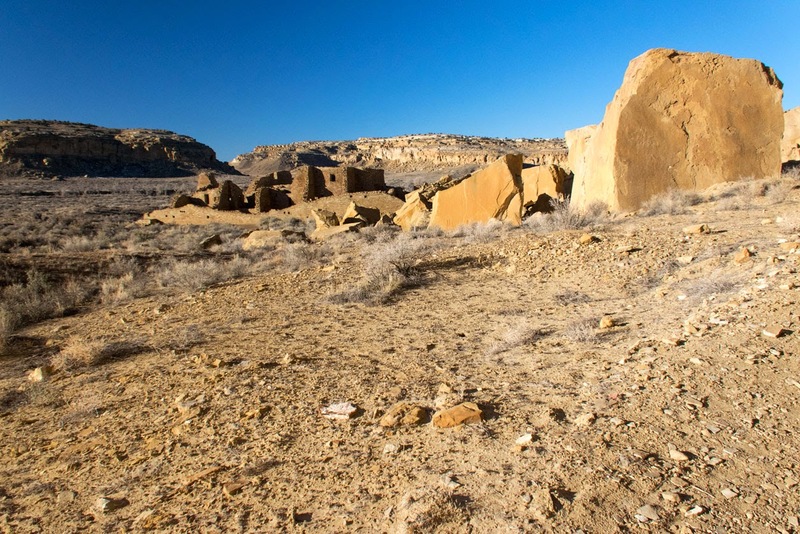 This is the most thoroughly studied of all the sites in Chaco Canyon. It was constructed in stages between 850 and 1150. Here I'm trying to capture what everyone who photographs this site does: the glowing light through the many doors and windows. This isn't great. 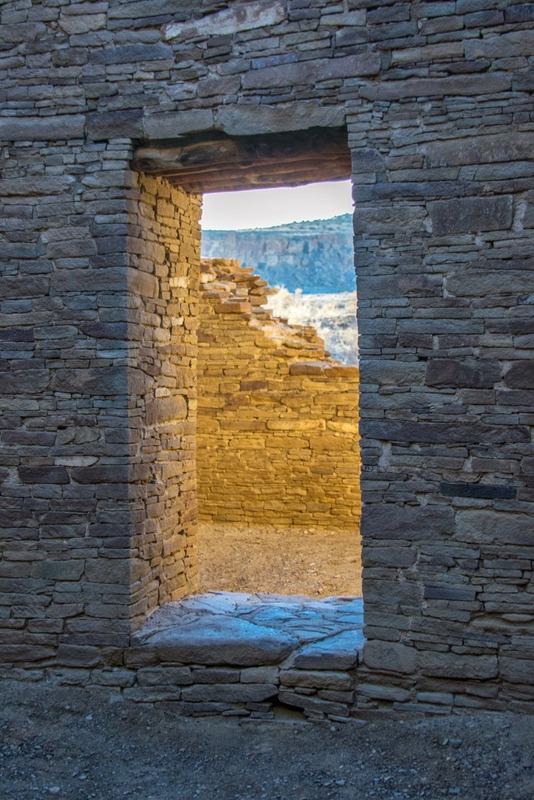 Again I found myself intrigued at the different construction types, wondering at the T shaped doorways, intrigued by what it must have been to spend time in your family's kiva, and just generally imagining what it must have been to live here 800 years ago. 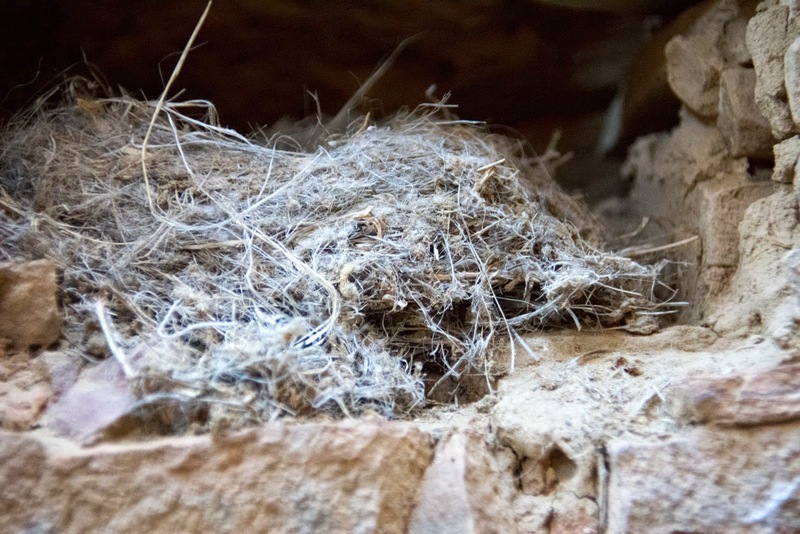 Bird nest in a niche inside Pueblo Bonito. 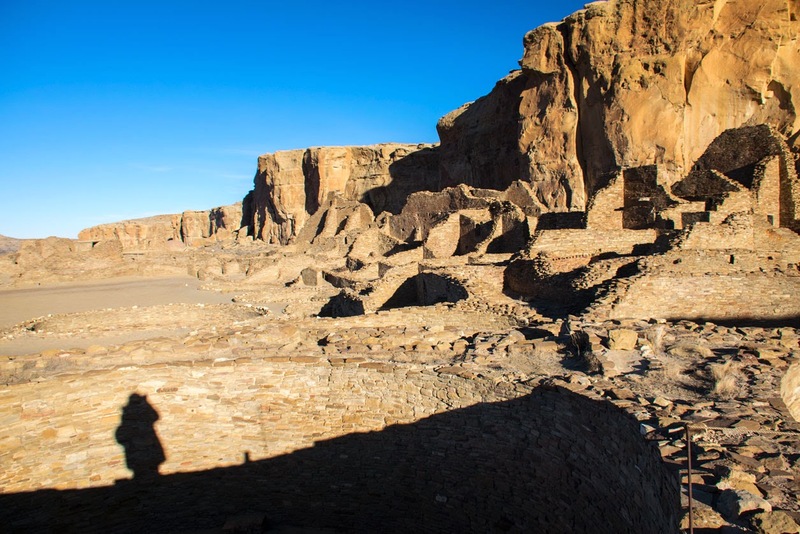 Pueblo Bonito. Portrait of my shadow in the harsh morning sun. 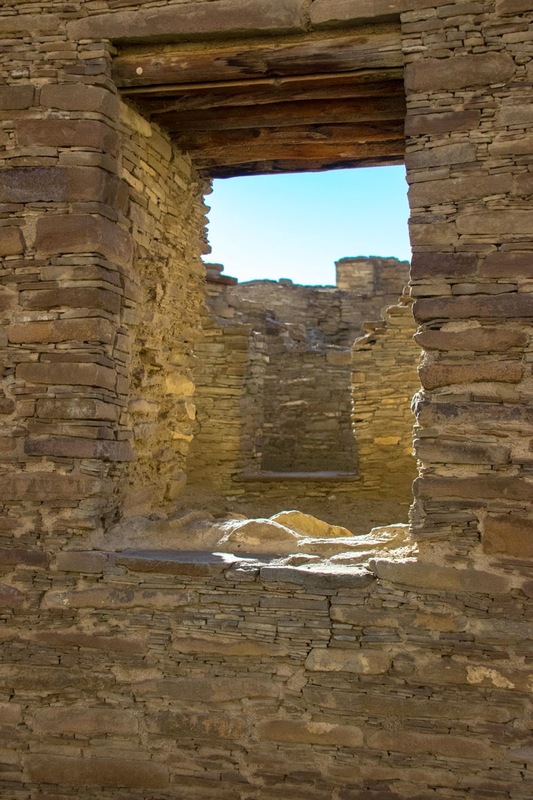 The Pueblo Bonita Great House served many purposes: ceremonial, adminstrative, trade, storage, hospitality, astronomical, and a place to honor the dead. Only a small portion of its more than 600 rooms served as living quarters. 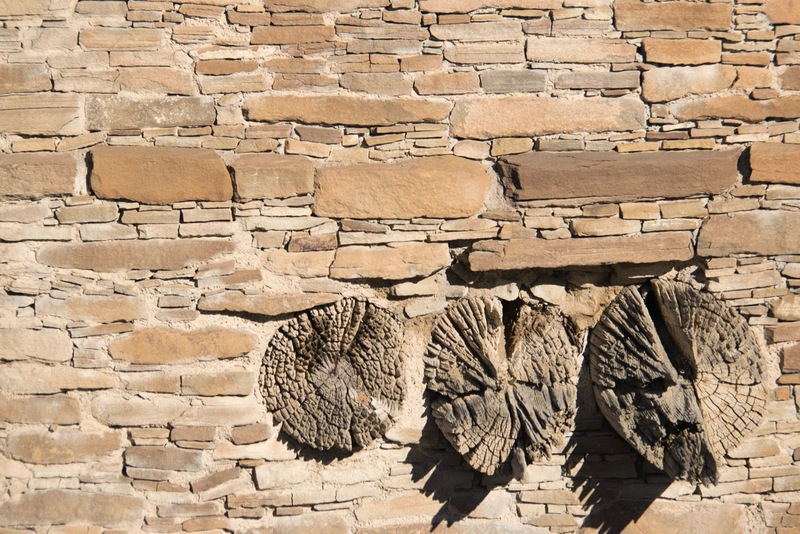 The Great House rose four and five stories above the canyon floor and covered three acres. Looking at Pueblo del Arroyo from the site of another Great House that hasn't been excavated. 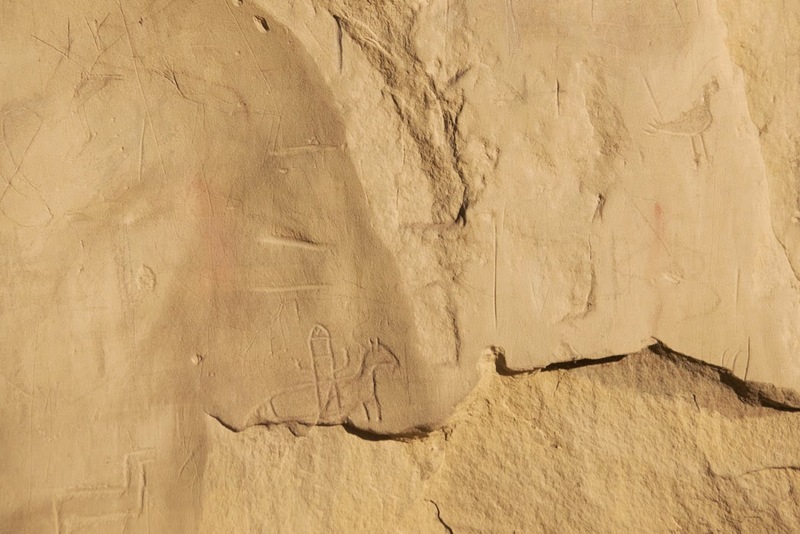 I nearly drove myself, and probably Traveler Thirteen, crazy trying to find this petroglyph of a bird. Took me forever to see it. 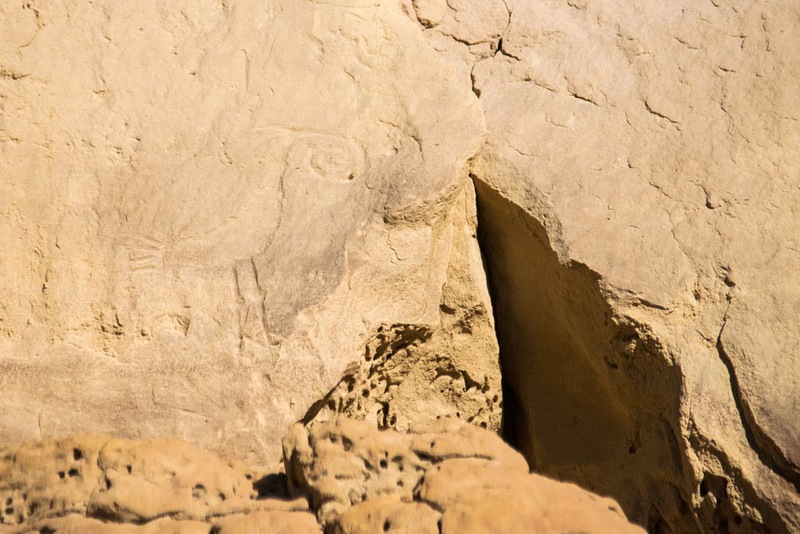 These petroglyphs show horses thus date to after Spanish arrival in the area. 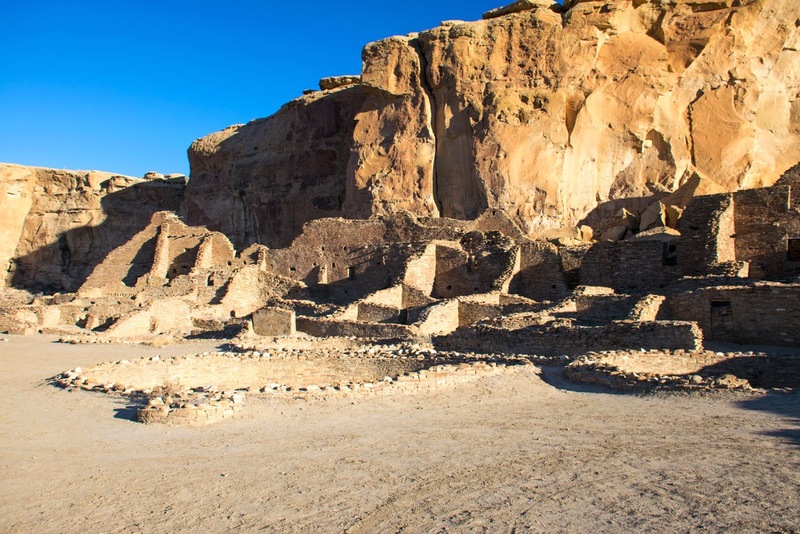 Chetro Ketl is the second largest Great House in Chaco. Constructing beginning around 1020, Chetro Ketl had between 450 and 550 rooms. 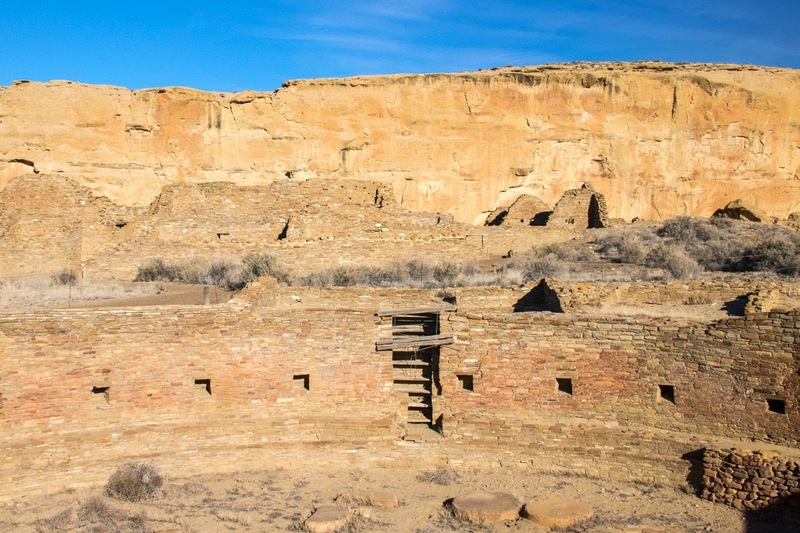 It has one of the largest kivas built in the American Southwest. A closer look at the masonry and original wood beams. Chetro Ketl. 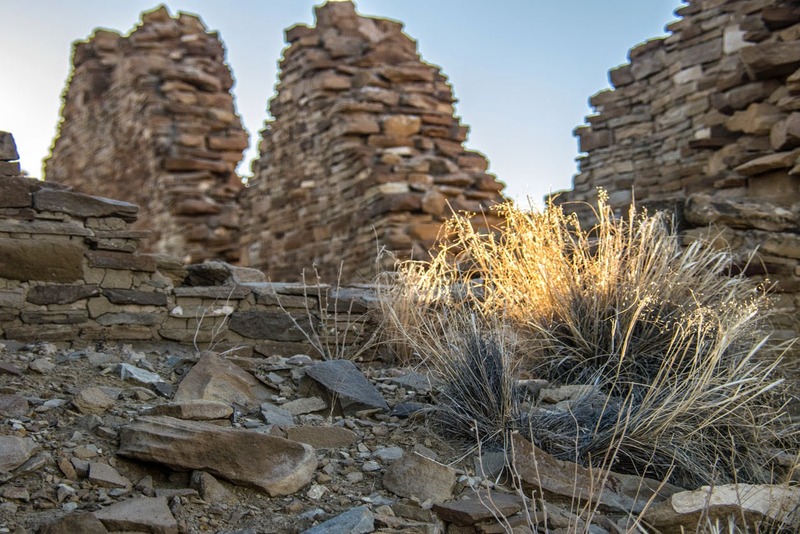 As we left the ruins we heard the high pitched yips of happy coyotes as they were reunited somewhere southwest of us in the canyon, perhaps celebrating a successful hunt. 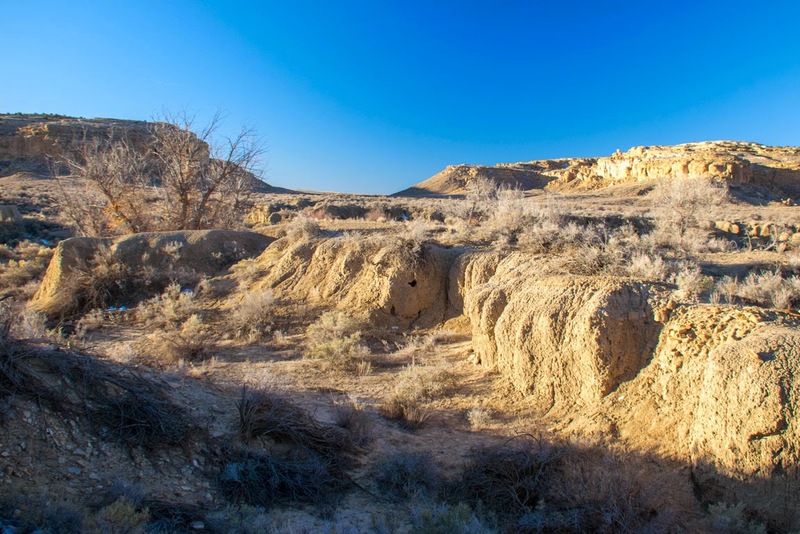 We then took the dogs out along the Wajiji Trail and photographed Fajada Butte, who has very changeable moods depending on how the light hits her. Now it was time to head out. Our destination was Ramaah, New Mexico. 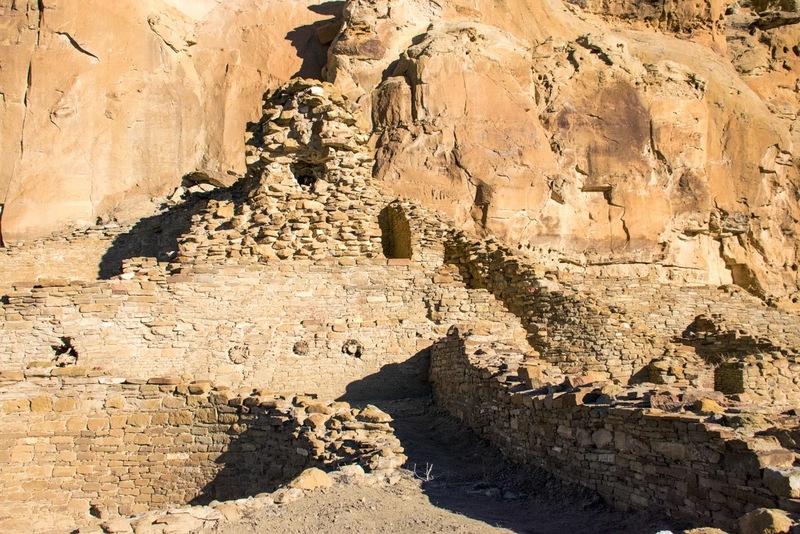 There was a lot of driving between Chaco and there, and most of it on the notoriously often impassible south route out of (and into) Chaco Canyon that is not recommended for RVs (caravans/campers). Even the government website says its nearly impassible. We stopped at the Visitor's Center to inquire about just how bad the south route was. We were told it had been worked on but there was at least five miles of really bad washboard conditions and lots of cattle grates. Driving directly south on Route 57. This is the part that is in relatively good condition. We packed up the camp and got the dogs situated in truck and then headed out, daring the notorious south route. It was a little hairy but not impassible. Some of the cattle grates took a bit strategic maneuvering on Thirteen's part to negotiate some of these, especially when the land and road dropped dramatically in steep inclines on the other side of some of these grates that you couldn't see until you were at the very top of the incline. 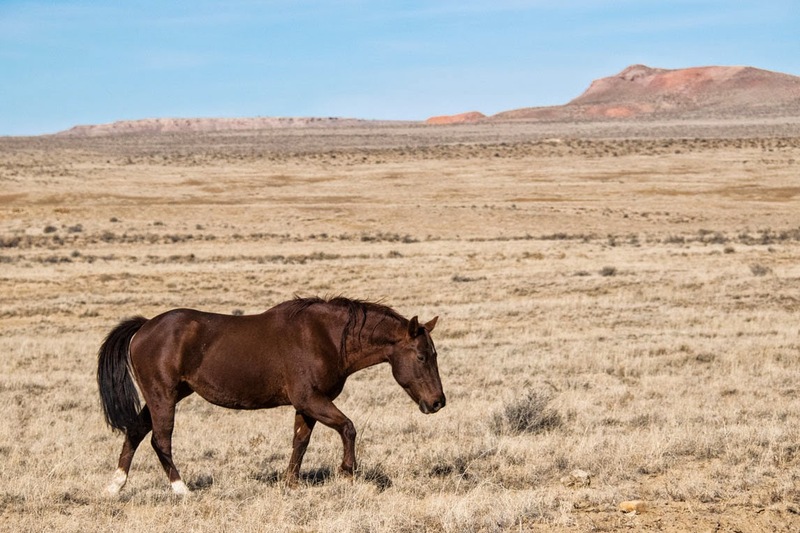 But we made it down Route 57 to Route 9 and then onto Route 40 toward Gallup, passing through Reservation and ranch lands. 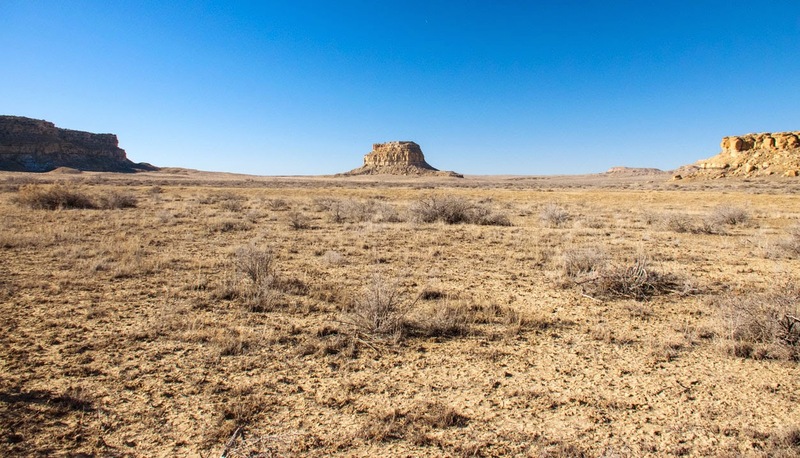 We drove through wide grasslands surrounded by distant hills. Our only companions on the road where a red-tailed hawk, four horses, and distant cattle. One of four horses we passed. 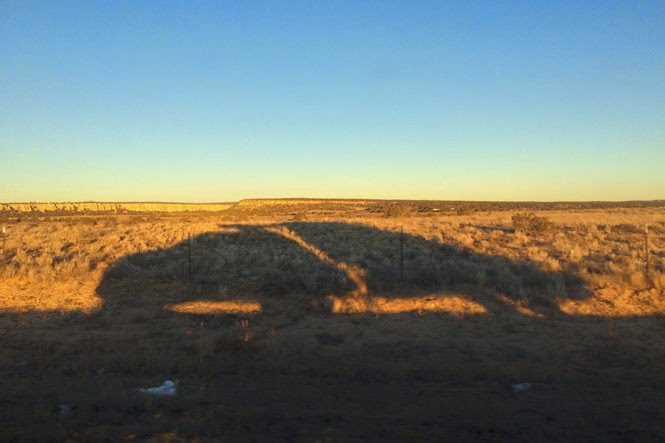 As we drove toward Gallup the land changed again --New Mexico is ever changing this way -- and red cliffs like fingers reaching out rose above the plain the highway followed. Impossibly long freight trains snaked their way passed us as we drove. 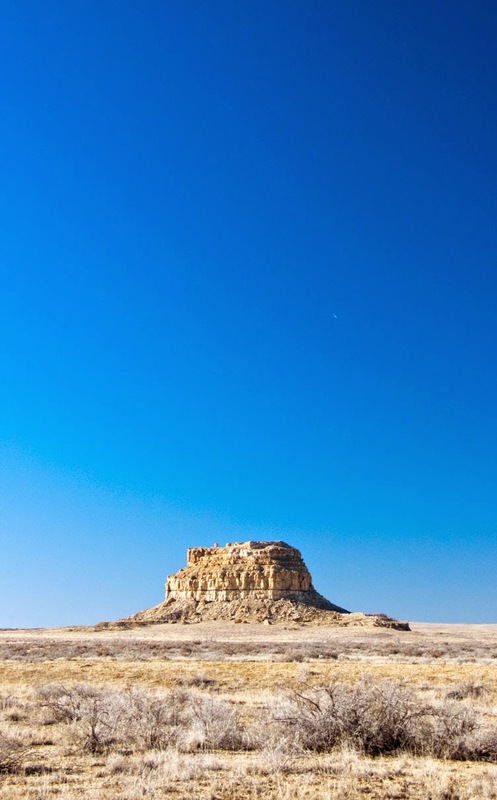 Gallup, New Mexico passed by in a blink of an eye and trading posts. We headed south from here through Navajo and Zuni lands studded with pinyon pines and juniper, all overseen by sloped cliffs. 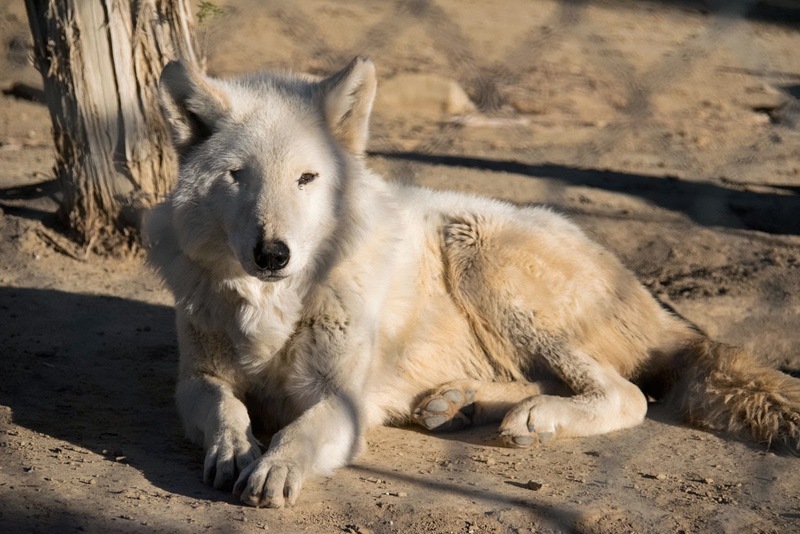 Our destination was the Wild Spirit Wolf Sanctuary in Ramaah, New Mexico. 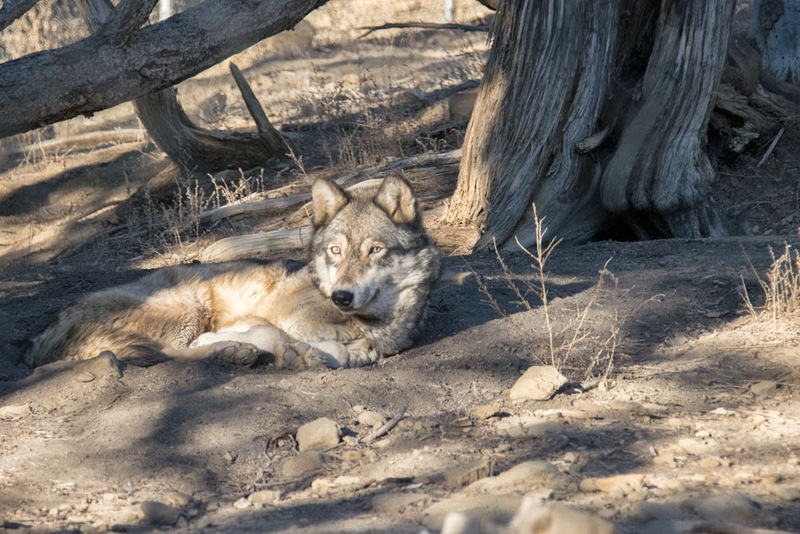 The sanctuary is home to over sixty captive-bred wolves, wolf-dogs, and other wild dog species that have been rescued from abusive conditions. This place made me sad. They are doing good and necessary work but its the stories of how these animals ended up here and the short-sightedness and stupidity of the humans that abused them that made me sad. And you can see that these animals miss the wilds that they have never really known. All except the fox, that is. He seems quite content with his lot in life, having been rescued from a zoo where he was kept in far less generous accommodations. As we walked through the sanctuary and our guide introduced us to the many canid residents here, juncos hopped across the ground and flitted through trees. I saw my first Western Bluebird as well. And then the wolves and wolf-dogs howled. And then they did it again. The few rescued coyotes there joined in the second time with their higher yipping calls. There is nothing like the chorus of 60 plus captive wolves and their relatives howling. It reaches into your heart and rips at your soul and makes you wish for wild distant places. Driving toward El Morro. Our shadow makes the truck and trailer look like children's toys. 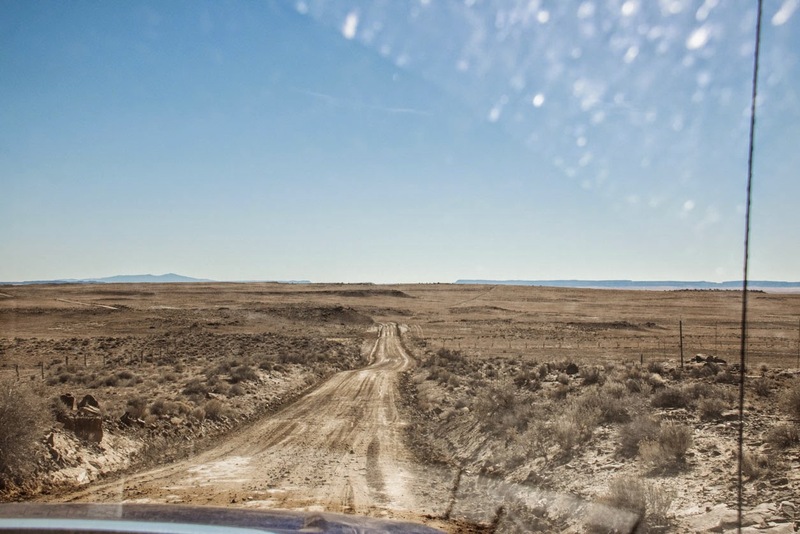 We then headed east on Route 53 to the El Morro RV Park. It's a trippy place. The owner/manager was very welcoming to us on this cold Thanksgiving eve. The campground is nicely wooded and comes with free range chickens wandering through at random times (more on those in the next post). It is also a designated wildlife habitat. 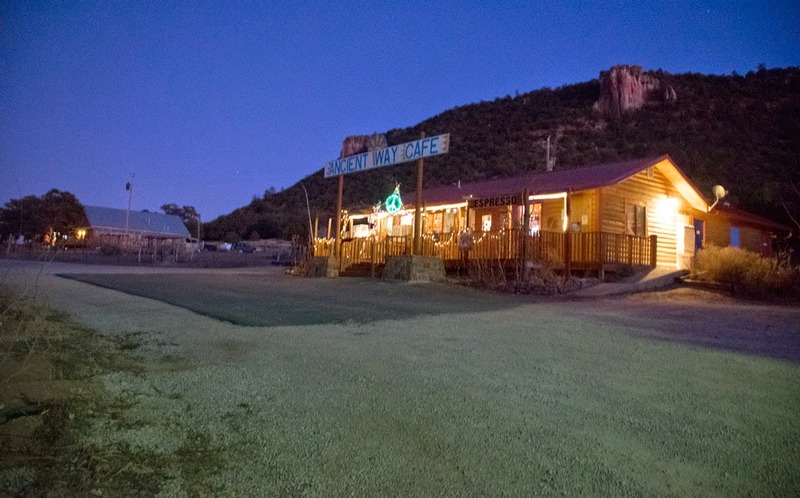 The Ancient Way Cafe and entrance to the El Morro RV Park. We made chicken stuffed with broccoli and cheese wrapped in bacon on the camp stove and had that over cous cous. And then it was time for some very welcome hot showers (Chaco doesn't have shower facilities).